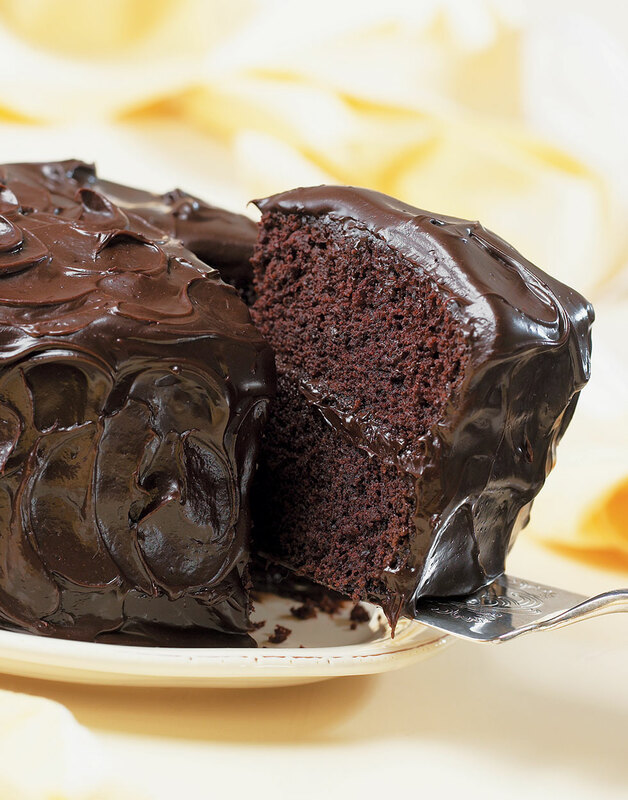 This is not a molten-middle, blacker-than-night chocolate cake. It's the kind of cake grandma used to make, with "Betty Crocker" looks and one-of-kind flavor. To give the icing for this cake a chance to set up, make it before starting in on the cake. And be sure to use heavy cream (preferably not ultra-pasteurized). Lighter dairy products just won't set up. Preheat oven to 350° with rack in middle position. Coat two 8-inch-round cake pans with nonstick spray. Whisk together flour, sugar, cocoa powder, baking soda, and salt in a large mixing bowl. Combine water, oil, vinegar, instant coffee, and vanilla in a large measuring cup. Add to the dry ingredients and whisk just until combined—a few lumps are okay. Divide batter among pans (3 cups in each), then bake until a toothpick inserted in centers comes out clean, 35–40 min. Cool cakes for 15 minutes on a rack, then invert onto the rack. Leave cakes upside down to cool completely (this flattens domed cakes). To assemble, set one cake layer on a serving plate and spread with 1 cup Glossy Chocolate Icing. Top with second cake layer, then spread remaining icing over top and sides. Combine wet ingredients with dry, whisking just to combine. Do not overmix or cake could be tough. When a toothpick inserted in center of cakes comes out clean, they're done. Cool cakes completely.